Eyeko have done it again and have brought us another wonderfully versatile yet affordable product. The purpose of this magical eye-liner is to turn any of your old, new, or favourite eye shadows into a liquid eye-liner. It is such a simple concept that is is bewildering that no one else had cottoned onto the idea before! Simply run the applicator along your eye-shadow and ‘alakazam!’ you have turned eye-shadow eye-liner. Not only is this a way cheaper alternative to going out and buying a multitude of rainbow coloured liquid eye-liners, but it also produces a stronger colour and sturdier line than just using regular eye-shadow in it’s powder form. Eyeko has given a few tips on how to get the most our of their newest product, the first if which is to try alternating colours on the top and bottom lids, mixing your own shades for an individual look, or match your eye-shadow and eye-liner. 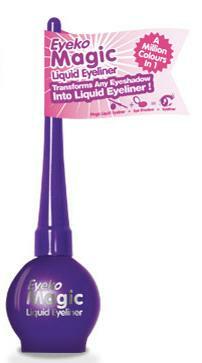 Eyeko Magic Eyeliner is priced at £5 available from Superdrug stores or online from the official Eyeko website.